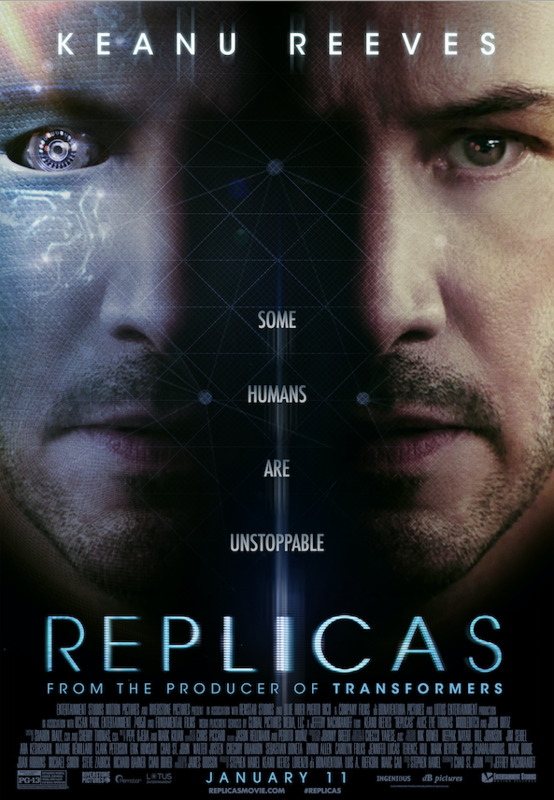 Here is the trailer from the upcoming film “REPLICAS.” Directed by Jeffrey Nachmanoff, starring Keanu Reeves, Alice Eve, Thomas Middleditch and John Ortiz. After a car accident kills his family, a daring synthetic biologist (Reeves) will stop at nothing to bring them back, even if it means pitting himself against a government-controlled laboratory, a police task force, and the physical laws of science. Here is the trailer from the upcoming film “PLEASE STAND BY.” The film is directed by Ben Lewin, starring Dakota Fanning, Toni Collette, Alice Eve, Patton Oswalt. A young autistic woman runs away from her caregiver in order to boldly go and deliver her 500-page Star Trek script to a writing competition in Hollywood. On an adventure full of laughter and tears, Wendy, played with exquisite delicacy by Dakota Fanning, follows the guiding spirit of Mr. Spock on her journey into the unknown. “It is there for us to conquer, not to fear.” Directed by Ben Lewin (The Sessions) and also starring Academy Award® Nominee Toni Collette, with a special guest-appearance by Patton Oswalt. Here is the trailer from the upcoming film “COLD COMES THE NIGHT”. The film is directed by Tze Chun, starring Alice Eve, Bryan Cranston, Logan Marshall-Green, Ursula Parker, Leo Fitzpatrick. COLD COMES THE NIGHT in theaters January 10, 2014. Here is the trailer from the upcoming film “SOME VELVET MORNING”. The film is directed by Neil LaBute starring Stanley Tucci, Alice Eve. Sony Pictures Worldwide Acquisitions (SPWA) has acquired all domestic and international media rights to Tze Chun’s COLD COMES THE NIGHT, starring Alice Eve (Star Trek Into Darkness), Bryan Cranston (Breaking Bad), and Logan Marshall-Green (Prometheus). The film also stars Ursula Parker (Louie) and Leo Fitzpatrick (The Wire). Currently in post-production, COLD COMES THE NIGHT is directed by Tze Chun, and written by Tze Chun, Osgood Perkins, and Nick Simon (Removal). Chun’s acclaimed debut feature, Children of Invention, premiered at the Sundance Film Festival and won 17 festival awards. Chun’s film tells the story of a struggling motel owner (Eve) who, along with her daughter (Parker), is taken hostage by a career criminal (Cranston) as he attempts to retrieve his cash package from a crooked cop (Marshall-Green). Everyone gets in over their heads, and a series of double-crosses leaves a string of dead bodies in this pulse-pounding story about desperation and survival. The film is produced by Mynette Louie of Syncopated Films and Trevor Sagan of Sasquatch Films. It was financed by Three Point Capital, Whitewater Films, and Cherry Sky Films, and executive produced by Scott Halle, Rick Rosenthal, Nick Morton, Jacob Pechenik, and Ali Jazayeri. Lauren Craniotes, Vice President of Production for SPWA, is overseeing the film for SPWA. UTA Independent Film Group and Andre Des Rochers of Gray Krauss Stratford Des Rochers LLP represented the filmmakers in negotiating the deal with SPWA’s Executive Vice President of Business Affairs, Michael Helfand. Chun is represented by WME. Eve is represented by Untitled Entertainment, UTA and Independent Talent. Cranston is represented by UTA. Marshall-Green is represented by 3 Arts and CAA. Here are 4 behind-the-scenes featurettes from Paramount Pictures’ Star Trek Into Darkness. The film is directed by J.J. Abrams, starring John Cho, Bruce Greenwood, Simon Pegg, Chris Pine, Zachary Quinto, Zoe Saldana, Karl Urban, Anton Yelchin, Benedict Cumberbatch, Alice Eve, Peter Weller. Star Trek Into Darkness hits theaters on May 16, 2013. Here a behind-the-scenes from Paramount Pictures’ Star Trek Into Darkness. The film is directed by J.J. Abrams, starring John Cho, Bruce Greenwood, Simon Pegg, Chris Pine, Zachary Quinto, Zoe Saldana, Karl Urban, Anton Yelchin, Benedict Cumberbatch, Alice Eve, Peter Weller. Star Trek Into Darkness hits theaters on May 17, 2013. Here are 2 film clips from Paramount Pictures’ Star Trek Into Darkness. The film is directed by J.J. Abrams, starring John Cho, Bruce Greenwood, Simon Pegg, Chris Pine, Zachary Quinto, Zoe Saldana, Karl Urban, Anton Yelchin, Benedict Cumberbatch, Alice Eve, Peter Weller. Here is the new trailer and poster from Paramount Pictures’ Star Trek Into Darkness. The film is directed by J.J. Abrams, starring John Cho, Bruce Greenwood, Simon Pegg, Chris Pine, Zachary Quinto, Zoe Saldana, Karl Urban, Anton Yelchin, Benedict Cumberbatch, Alice Eve, Peter Weller. Here is a first look featurette from Paramount Pictures’ Star Trek Into Darkness. The film is directed by J.J. Abrams, starring John Cho, Bruce Greenwood, Simon Pegg, Chris Pine, Zachary Quinto, Zoe Saldana, Karl Urban, Anton Yelchin, Benedict Cumberbatch, Alice Eve, Peter Weller.